There are hundreds of services that help you make your website or HTML5 app faster and more secure, but probably none is as comprehensive as Cloudflare. Cloudflare is a DNS-level reverse proxy that acts as a gatekeeper to your website/app, while providing several performance and security enhancing features. It offers a feature rich free plan, so there’s really no reason you shouldn’t try it out. 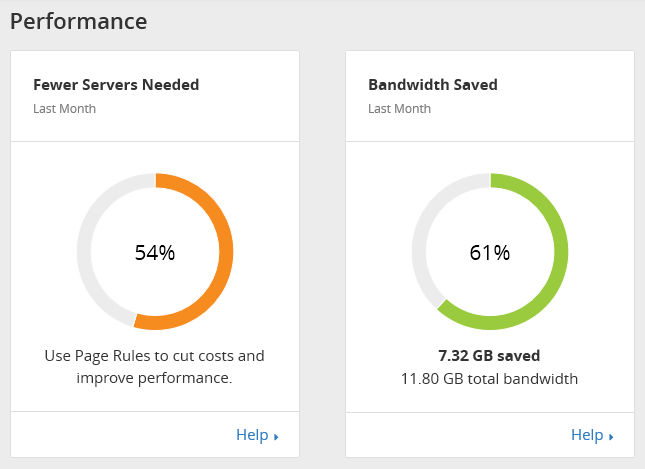 If you pay by the bandwidth and CPU resources for your site/apps, you can save anywhere from 30% to 90% of those fees just by turning on Cloudflare’s CDN. Even if you pay a fixed amount, like for a shared hosting or VPS account, you can be certain that a sudden spike in traffic won’t lead to your website being throttled or taken down by your web host. Not many tools can save a site from a Reddit avalanche, but Cloudflare does it well and does it for free. Cloudflare has several security measures that block “bad traffic” from ever reaching your website. Cloudflare blocks all IP addresses known for spamming and spreading malware from accessing your server. Every time a new threat is detected, Cloudflare adds it to its ever-expanding database and immediately protects all its customers. All this junk, if left unblocked, would have taken up precious CPU cycles and bandwidth, but with Cloudflare, they don’t. Cloudflare lets you set the level of security for your site. If you’re afraid that Cloudflare might show captcha screens to real human visitors, set the level to “Low”. If your site is being DDoS’ed by trolls, set the level to “I’m Under Attack!” and Cloudflare will challenge most visitors before they can get in. If you sign up for the paid Cloudflare Pro plan ($20/month), you can make use of Polish to optimize images, and Mirage to lazy load images (both working together to greatly reduce page load times). Other major Cloudflare features include full IPv6 support, custom page rules, flexible SSL support, full DNS hosting and management, IP firewall, content theft protection, and hotlink protection, all available for free. Signing up for Cloudflare is a pretty simple, 5 minute process that you can follow on their website. If your web host is a Cloudflare partner, creating an account and turning it on is even simpler from the control panel. As you can tell, we are big fans of Cloudflare here at Tech Orbiter. We will be publishing a lot more Cloudflare guides in the future, so stay tuned. What’s your thought on this amazing free service? Are you aware of, or a user of, any similar services? Let us know in the comments!